Q: How do I choose a suitable power amplifier for M&D® speakers? A: Mark & Daniel® systems are relatively low efficiency speakers. 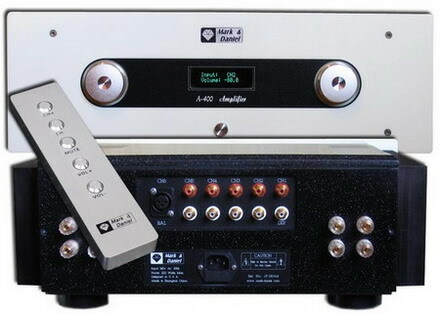 A good quality power amplifier with the output no less than 100W is recommended for most of M&D speakers. First of all, please make sure the power amplifier has high current driving capability before purchase it, due to both efficiency and impedance (nominal in 4 ohms) considerations. A high current power amplifier (w/ 100W output at 8 ohms for example) can drive up to 200W under 4 ohms operation in theoretical, or at least over 160W in practice. While driving Maximus with a 112W current (average efficiency in 84.5dB/2.83V/1m), it shall get an SPL output to about 105dB with two channels, enough to shake average listening room under the sound level. This SPL output may even be higher for M&D floor-standing speakers under the same condition due to higher efficiency. Ordinary AV amplifiers however, have poor current driving capability in most cases since its power supply needs to support too many channels at the same time. While driving M&D speakers, insufficient drive due to higher internal resistance of the power supply shall limit the music dynamics, cause high temperature rising, or even activate protection relays. The result is an unsatisfactory sound performance, especially having bad influence to the outstanding bass control of M&D speakers. Therefore, we suggest you choose a (2-channel) Hi-Fi power amplifier to drive your left/right main speakers rather than the ordinary AV amplifier, or choose a hi-end graded AV amplifier with THX certification. Another major concern is the sound quality to the amplifier itself. Since all M&D sound systems are having a high-resolution capability, our sound product acts more like a monitoring system rather than just a Hi-Fi speaker therefore. In other word, it can be too sharp to reveal detailing defects of an amplification system sometime. Try to compare and select a best amplifier affordable with decent sound quality as possible.